I’m not sure why but as much as I love to customize I really prefer my own dolls to be pretty close to stock if not completely stock. Above is the new Primadolly Aubrena. She’s really just lovely as is. I don’t have any desire to change her except maybe replace her orange chips. I used to sand matte these dolls as soon as I got them but lately I can’t even do that if they have nice make-up. I don’t think they come as shiny as they used to. I thought I got her to customize but she’s too perfect. Maybe I’ll have to get another in a few months simply for customizing. Hopefully her price won’t shoot up. She’s not limited and starts for under $100 but she’s selling out at the cheaper places like Hobbylink and Hobby Search. The exchange rates these days are terrible so Yahoo Japan hasn’t been a good option. Below is a new Kenner. 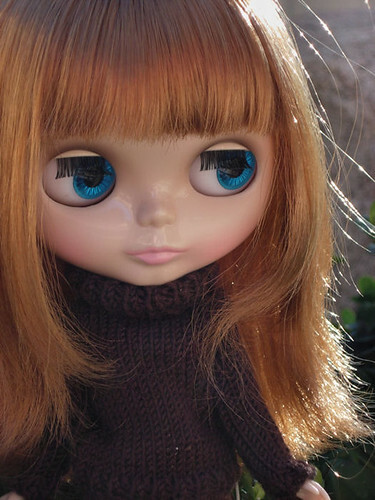 I sold off several dolls and clothes to get her. The seller was patient enough to let me make payments. Plus she was a much better deal than if I went to Evilbay. She didn’t need much work done to her. Her forehead had a big scrape on it which I sanded away and there’s still some faint little scratches left but not very noticeable. She got some more de-frizzing and her lips were touched up. Her eyeballs were a little yellowed so I whitened those up a bit. I may still apply pearl drops to whiten them some more but I’m pretty happy with her for now. She’s so sweet. 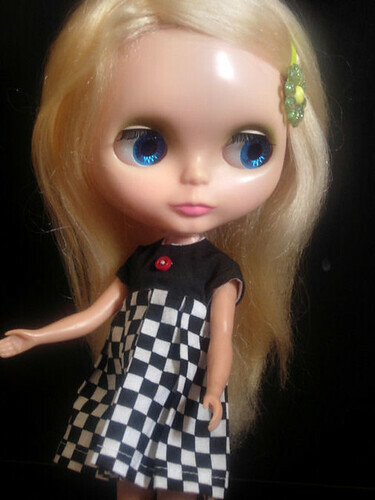 A nice companion for Fern my blonde Kenner. My Lati Lea finally arrived. I was tracking her shipment and anxiously awaiting the doorbell. 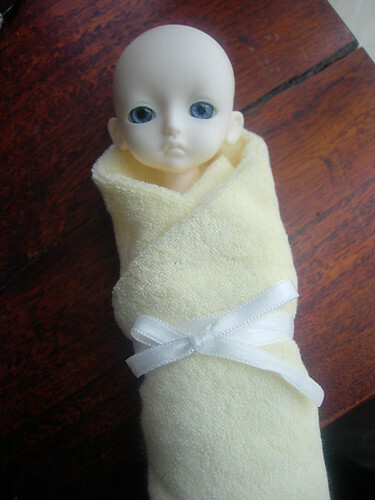 When she arrived, I took her out of her box and she was sweetly swaddled in a yellow terry blanket. I had hinted to my husband that I wanted all her default options but he missed adding the make-up. Ah well, a completely understandable oversight if you’re unfamiliar with the ball-jointed doll ordering process- which he is. So it was up to me and I quickly completed her look as seen in the first picture. I really wanted her to be ready to play but it’s good practice on my ABJD painting skills and I’m happy with the results. 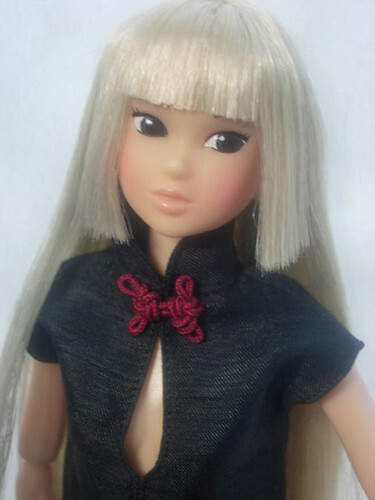 If I get another Lati, which I probably will, I’ll definitely order make-up though because for some reason I prefer my own dolls to be closer to stock or factory finished. I named this cutie Meegiko. These things are sooo cute and fit in the palm of my hand. 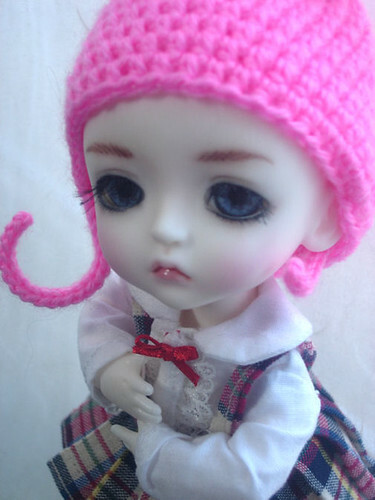 She’s wearing a Simply Kir hat. She did come with a wig also. I think even my husband is taken with these little ones because they probably remind him of our living little ones. Probably the appeal for me also. Saturday some fellow Blythesters and I had a meet. We were hoping more people would show but I think most forgot about it. But there were 4 of us and it was fun to visit one of my alma moder colleges. Here’s a group shot of all the plastic, (and resin,) girls. O.k, you may have noticed the word “boycott” in my title. So now I get on my soapbox about the boycott. EBay is making a bunch of changes starting February 20th. A lot of these changes are very bad for sellers and buyers. Mostly the small sellers. Think of it like Walmart moving into a small town and pushing out the Mom and Pop businesses. You can learn more about the changes here. It’s a good starting point and has a bunch of links to media, videos, articles, charts and graphs and to the policy changes from the eBay itself. You can go to the discussion forums on eBay itself but apparently a lot of censoring is going on. The boycott starts February 18th and ends on the 25th. I will probably stop using eBay altogether unless they reverse these changes. The boycott means no buying or selling during that week. Please support it by not listing or buying on eBay. Many sellers are migrating to other auction sites. Please patron those. There’s a list here. There’s a lot of buzz going on about this boycott. I don’t think it’s going to be like spitting in the ocean as previous boycotts have been for eBay in the past. O.k. off my soapbox and back to work.